He graduated in 1981 from Law School of the University of Turin and then attended the Faculté Intérnationale de Droit Comparé – Université de Strasbourg. 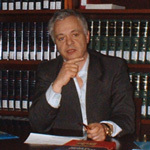 Monateri has been Visiting Scholar at University of Cambridge, Harvard Law School, Berkeley Law School, University of Sidney, University of Melbourne, University of Jerusalem, Université Panthéon – Assas (Paris II), Université de Louvain . Developing the research approach followed in a previous essay (Règles et techniques de la definition: La synecdoque française), in La Sineddoche (1984) Monateri’s pioneering analysis discloses the strategies of legal discourse, insisting on the rhetoric devices used to enunciate, to declare, or to express and explicate the rules. Exploring the interfaces between contract and property through a comparative study of France, Germany and Italy, Monateri brings to light the shadow line that divides (or dissociates, insofar as the Author speaks of an inherent, underlying dissociation) law from its interpretation. In this perspective it is possible to unveil the synecdoche that frequently recurs in the linguistic formulations employed to define the operational rules: there is a clash between the rule declared and the operational rule, as the first denotes or specifies only a part of the second, keeping the lid on specific elements. Monateri’s study has two major implications. The first deals with the epistemological understanding of Law and its ontological statute. In fact La Sineddoche professes the radical refusal of the metaphysical unity of Law arguing that what we understand and defines as Law is the product of competing models and conflicting texts consciously interpreted by an elitist community of ingenious lawyers, who act as the skilful selectors of figures of speech and forms of expression. The second implication deals with the interrelations between law and cognitive sciences. La Sineddoche shows that relation between perception, reality and thought is firstly rhetorical; it could be said logic only on a secondary level. The phenomenological and ontological structure of Being are communicated by the means of figures and tropes. On this ground Monateri’s analysis is one of the first attempts to depict the figuarality of Law and to construct a theory of representational understanding of a normative world. first published in Hastings Law Journal and then translated into Spanish, Chinese and Italian, Monateri radically questioned the roots of the so called Western Legal Tradition. or, better considered, from a time out of mind. In Black Gaius Roman Law becomes an historical issue. The essay represents a structural claim for a new consciousness when we are dealing with the crafting of our past. On this ground Monateri renews the conventional lecture of legal traditions and defines new scientific perpectives for comparative approach. In the first direction, Black Gaius tells us that legal traditions arise from conflicting narratives, from competing packages of factual elements and rhetoric devices used to assemble the past in the form more apt to legitimate a deliberate sense of the present. There is a strategic imperative that justifies the accepted account on Roman Law, not a devoted custody of the pastness of the past. The unprecedented remark develops the inner thought we can find in the pages of La Sineddoche: what is under inspection is precisely the distance between law and interpretation; historical past and traditional narratives; the perceived past and the accepted past. Monateri’s purpose is to come back to the primary Anfang and to its undefined ontological root: all the interpretative accounts match with the unfolding of Spirit in time and consequently decide on the ambiguous statute of the origins. The declaration of a tradition is an ideal and intellectual process that shapes the uncertain possibilities of the original source, fixing an exegetical construal in the structure of a specific discourse. Interpretation (or – that is the same – legal traditions as the explication of the juridical past) is the closure of the original premises, the conscious declension of the primal Logos. With specific regard to comparative approach, Monateri’s research brings to the surface the purposive and preconceived design that inspires the mapping of the world into different legal systems and families. This is the path toward the assertion of the multicultural origins of the Western Legal Tradition and of the biased qualification of the same as Western. The geographical qualification secretes the contaminated origins with the aim to proclaim the myth of the supremacy of the Western canon. Comparative law may be used to translate into legal discourse the subtle relation between space and narrative and, in the end, to endorse new projects of cultural governance in the context of globalization. One of Monateri’s favourite field of research is tort law. The most significant works on this subject are Cumulo di responsabilità contrattuale ed extracontrattuale (1989) and La responsabilità civile (1998). The first book is an attempt to reassess the critical threshold questions that arise from the interaction between contractual and tort liability according to an approach of economic analysis. The method of enquire is practical: Monateri scrutinizes several cases and decisions so to re-frame the way in which Courts of different legal systems have crafted liability doctrines. The innovative perspective is the lecture of the cases per se, without any kind of intellectual mediation (such as the interpretative discourses), so to dismiss the biased arguments and assumptions ususally applied by the jurists. This original presentation of cases and materials bring into light an unexpected and underlying rationality beyond the assertive declaration of texts and rules, a form of an objective efficiency that law has to find in events in itself and consequesntly has to declare, not to order or normalize. The second work represents a clear and meticulous recasting of Italian liability rules and doctrines. The volume copes with all the issues that are at stake, separately defining the elements of tort liability. The explication of Italian Authors’ thought is conducted in a way of a conscious divorce from their respective ideologies: in this sense their doctrines are objectified. Both of these works mark a pivotal point in the study of tort law, insofar as they develop new human approaches into detailed, applied law. Moreover these works testify how tort law is a clashing law where decision is functionally designed to fill the gap between law and interpretation. Monateri’s thought has practical implication, insofar as several judgments of Italian Supreme Court (Court of Cassation (Italy) complies with its principal tenets. Monateri has participated to the scientific debate on interpretation introduced by Vattimo and Derrida- His main aim is to discuss on interpretation not as a philosophical issue, but as a practical matter. The theory on interpretation has to been re-investigated as a representation of decisional procedures, not as an intellectual tool. In Correct our watches and in All this and so much more, moving from a non traditional perspective, Monateri separates the sphere of rules from the arena of their justification; casts doubt on the proper qualification of the operation on texts structure in terms of interpretation. He purports that exist a paradigm of Interpretivism assigning to such operations the label of interpretations, and support a shift toward a different paradigm non-interpretivism which openly acknowledges the non interpretative character of the so called interpretations. All this, of course, goes in the direction of a deeper and critical reappraisal of Schmitt’s decisionism. In a correlated field of research Monateri has published Legal Formants in Newman P., The New Palgrave Dictionary of Economics and the Law, where he points to a theory of law in terms of antagonistic orders. In this way historicism, hermeneutics and dialectics riemerge as proper tools to handle complexity against every illegitimate reductivism. One again what is at stake is the distinction between the operational rules (the practices of a legal system) and the symbolic act (the discourses and narratives used by the lawyers to justify and rationalize the rules). Monateri’s present research sought to explore the crucial role played by Sovereignty in the construction of Modernity. Sovereignty is conceived as a decisive issue in the sphere of public law as well as tort law is the corresponding decisive issue in the sphere of private law. As Monateri brilliantly testifies in his essays Sovereign Ambiguity. From Hamlet to Benjamin via Eliot and Schmitt, a very insightful analysis of legal and political framework compels us to explore Schmitt’s and Benjamin’s thought from un unexpected standpoint, supporting this critical investigation with the intentional reference to literary texts. In this perspective Monateri copes with Agamben’s recall to the state of exception as a paradigm of government. Breaking the veil that covers the ambiguities in the state of exception is a necessary condition for a real understanding of the stakes involved in the difference between Juridical and Political and for a clear definition of what political action means. From this point of view Monateri looks at the possibility of a re-foundation of legal and political ontology. Moreover, according to a political theology approach, the state of exception is conceived as the other side of messianic age, a kind of foucaultian device apt to make intelligible the multifarious forms of incarnation of the Law in its historical existence. In these recent studies Monateri comes to question the same statute of Law as a cultural form. Italian Association of Comparative Law A.I.D.C.